More than any other facial feature, your eyes are the most revealing. When someone first meets you, your eyes are the first things that they notice. Puffy, drooping eyelids or eyebrows give a fatigued, angry look. Eyelid surgery can remove the excess fat and drooping skin of the eyelids, giving a more alert and rested appearance. Sagging (ptosis) of the eyebrows occurs as a person ages just as the rest of a person’s skin. 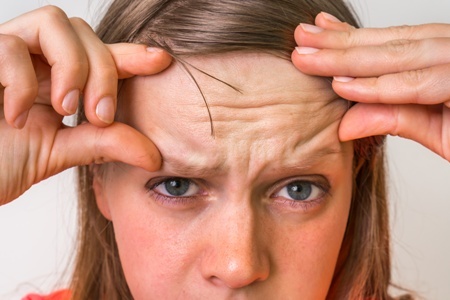 This eyebrow ptosis not only causes a tired angry appearance itself but also causes the appearance of excess upper eyelid skin and “crows feet” wrinkles lateral to the eyes. Many patients need the eyelids and eyebrows addressed at the same time. Dr. Levi Young at Advanced Cosmetic Surgery offers multiple options for relieving tired eyes, sagging eyebrows, and other issues affecting the upper face. Call 913-341-2188 today for a free consultation at our office in the Kansas City area. Eyelid and brow lift surgeries are performed on men and women of all ages who want to improve their appearance. These surgeries are usually performed to minimize the effects of aging. A personal consultation and exam is very necessary if you are considering eyelid or brow lift surgery. Dr. Young will assess the multiple factors involved and explore the various options and possible medical problems. You should be prepared to provide complete past medical information including previous surgeries, medical problems, and medications. During your consultation, we shall evaluate the skin quality, fat pads in the eyelids and tone of the eyelids. Dr. Young will manipulate the eyebrows and eyelids with you looking in a mirror to evaluate what procedure gives you the result that you desire. Usually an incision is made just beneath the eyelashes. With this incision, excess skin and fat can be removed. Occasionally the fat is not removed, just repositioned in areas of hollowness. If only excess fat is to be removed this can sometimes be done with an incision inside the lower lid called a “transconjunctival blepharoplasty." An incision is made that follows the natural lid crease about one-third of an inch above the eyelashes. Excess skin, muscle, and fat can be removed with this incision. By following the natural lid creases, the incision is camouflaged when it heals. The brow lift procedure can be done with four to five small incisions hidden in your scalp and using an endoscope to do the required surgery at the eyebrows. This endoscopic technique works very well in many patients. Some patients with very lax skin may have a better long-term result with the classic “open” technique, which utilizes an incision across your scalp. Both methods can have excellent result in the appropriate patient. Neither approach requires shaving of hair. The eyelid surgeries and brow lift surgeries are done as outpatient procedures. You may have bruising and swelling early on. It is common to have increased swelling 1 ½ days after surgery. Using ice packs over the eyelids for the first one to two days may help as well as keeping your head elevated. Saline eye drops help dry eyes. An antibiotic ointment may be provided by the hospital; it may be used in the morning and evening over the incision. Keep incisions clean and dry. We usually see patients the day after surgery to check the healing process. Eyelid sutures are usually removed in about three days and scalp sutures after about a week. Around two weeks after the surgery, most all of the swelling and bruising have subsided. Our patients can anticipate quality preoperative, postoperative, and follow-up care at Advanced Cosmetic Surgery. For more information about lower and upper eyelid surgery, brow lift, facelift, and other cosmetic facial surgeries, please call 913-341-2188 to schedule a free consultation with Dr. Young. Our board-certified plastic surgeon welcomes patients from Leawood, Overland Park, and throughout the Kansas City area, including Missouri.